Fayetteville is a city located within Cumberland County, North Carolina. Fayetteville is the seat of Cumberland County. Fayetteville is known that it is next to Fort Bragg. The population is over two hundred thousand. Fayetteville is located near Cape Fear. Many years ago, on the territory of today’s Fayetteville lived different tribes - it was more than twelve thousand years ago. Among the tribes stand Eno, Shakori, Keyauwee. The territory of present-day city housed the tribe Lumbee, which was more than fifty thousand strong. In the middle of the eighteenth century began the settlement of the upper Cape Fear River. The Scottish arrived and founded two settlements. Traders from the city of Wilmington insisted on the construction of the city to make it a border town. They bought land and built two cities - Cross Creek and Campbellton. Campbellton became known because here lived free black people and many poor white people. The town was known for its lawlessness. After the American Revolutionary War the two cities were united and were baptized in the name of Fayetteville, after General Lafayette, a French military hero. This was the first town named after General Lafayette. Afterwards, many cities were named in his honor. In June 1775 in the city was founded point of freedom - a document ahead of a year the Declaration of Independence. In point of freedom is a call for people to be willing to sacrifice their lives to ensure safety and freedom of the state. Robert Rowan was the man who first signed in this important document. Rowan arrived in Cross Creek in the sixties of the eighteenth century. On behalf of him are named Rowan street and Rowan Park. In the town lived for years Scottish heroine Flora MacDonald, which soon became known for the battle in Culloden. In the late eighteenth century Fayetteville experienced a real golden age. Here were built many schools, including the University of North Carolina. This is the oldest university in the country. The most famous preacher in the city became Henry Evans. He was a Methodist, a licensed preacher, but at the same time made a living as a shoemaker. He preached to blacks, which caused frustration among whites. Later, however, whites began increasingly to attend his services. In 1796 he built the first church in the city and called it African Meeting House, in 1796. In 1820 Fayetteville had a population of only three thousand five hundred inhabitants, but was still considered a town. 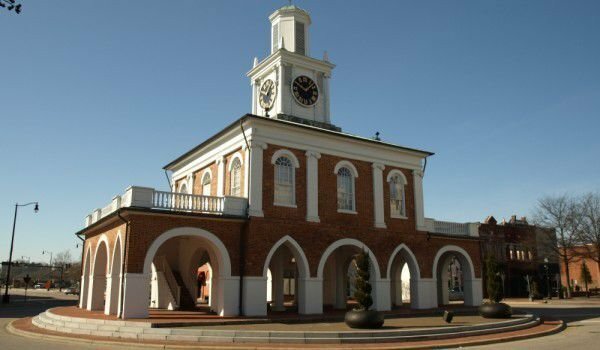 In 1832 was built a trading house, which soon became a center of commerce, it held official celebrations. In the city was sold only one slave. During the Civil War army General Willam Sherman raided the town and completely destroyed the cotton factories, and offices of the newspaper Fayetteville Observer. After World War II the population of Cumberland County has soared - by forty-three percent. The County became the largest in North Carolina. On the territory of Fort Bragg were trained over two hundred thousand soldiers during the Vietnam War. This led to antiwar protests in the city. Thus the city earned its nickname Fayettenam.